Professional football in Leeds has always been surrounded in controversy, even before Leeds United had even existed. After long standing battles between former Leeds City full-back, Charlie Copeland and the club, allegations were made by Copeland, by the way of a letter mailed to the Football League. In his letter, Copeland claimed that the club had engaged in illegal practices during World War I, by making bonus and expenses payments to some players which had exceeded the sums stipulated during war time, when professionalism had been suspended. After making some preliminary inquiries into the allegations made by Copeland, a joint commission of the Football League and Football Association consisting of Mr J C Clegg (FA Chairman), Mr C Crump, Mr J McKenna (President of the Football League), Mr H Keys and Mr A J Dickenson gathered at the Grand Hotel in Manchester. Several witnesses were called but the afternoon meeting was adjourned to an indefinite date and no official statement was made although Leeds City Football Club was given until the 6th of October to present requested documentation to the commission. Despite the uncertainty caused by the inquiry, the players carried on as normal and earned a point in a 1-1 draw at home to Wolverhampton Wanderers. Both goals came in the final half hour and Arthur Price’s successful penalty proved to be Leeds City’s last ever goal at Elland Road. An unofficial statement released to the media claimed that the following the inquiry into allegations made against the club, the board of Directors had resigned. This was swiftly denied by Director J C Whiteman. Due to a rail strike which had severely threatened the Football League schedule, Leeds City traveled to Wolverhampton by charabanc in order that they fulfill their Second Division fixture. They arrived safely and despite trailing by two goals to nil at the interval, they turned things around and came away with a surprise but albeit deserved 4-2 victory. The City goals, which included a hat-trick from Billy McLeod, all came in the final 20 minutes. The in-form striker had struck nine times in eight games. During the day the Lord Mayor of Leeds, Mr Joseph Henry, had been in Sheffield to meet Mr Clegg (Chairman of the FA and the Commission) and Mr Dickenson at Bramall Lane. The Mayor had proposed that the City Board of Directors should resign with immediate effect and he himself would oversee the running of the club. English football was stunned as news broke that Leeds City Football Club had been suspended. Mr Joseph Connor, the Chairman of Leeds City, had given consent that the required papers were passed to the authorities but other members of the board did not support the idea leaving the Football Association to enforce the suspension under Rule 48. Whilst Burslem Port Vale was already being mooted as a replacement for the crisis club, a further meeting of the Commission was set for the 8th of October 1919 to be held in Sheffield. Despite the Commission sitting for two and half hours, the inquiry was adjourned until Monday the 13th of October meaning that the club was unable to play its weekend home game against South Shields. During the meeting Mr Clark, a previous Director of the club, submitted the resignations of the Messrs Connor, Sykes, Glover and Whiteman. In addition the day’s scheduled Central League fixture between Leeds City reserves and Southport reserves was postponed. It was also announced that Connor, Sykes, Glover and Whiteman, along with former manager Herbert Chapman and a previous Director, Mr G Cripps were sine die and prevented from attending football matches and taking part in any footballing activities. Another Director, Mr Platts, was cleared of any wrong doing. The Lord Mayor makes an apology to the Leeds public for failing to ensure that the football club remained in the Football League. In a report in the Yorkshire Evening Post it was stated that it was a possibility that league football may never return to Elland Road. Due to the fact that there was a valuable clay deposit under the surface an offer had already been made to purchase the ground for the purposes of conversion into a brick works. However, there were two other possible outcomes around the future of the ground. Firstly, Yorkshire Amateurs had shown an interest in paying rent and playing their home games at Elland Road and secondly, the birth of a new club by the name of Leeds United who would apply to play in the Central League. The death of league football in the City of Leeds was realised when the players associated with the defunct club were summoned to a meeting at the Metropole Hotel, by a Football League committee, to try and determine their footballing futures. One hour was spent discussing the procedure and it was decided that the committee would set the transfer fees of the players and the managers of the Football League clubs, most of which were present, would be notified. The player would then be notified of any interest and he would have the final say on his own destination. It was also agreed that the Football League would pay the players one week’s wages following the demise of the club that employed them. Players who were in high demand were Billy McLeod, scorer of a second half hat-trick at Wolverhampton in City’s final game, goalkeeper Willis Walker, Tom Hampson, Simpson Bainbridge, Harold Millership, Arthur Price and William Hopkins. The fees of McLeod, Walker and Millership were set at £1,000, whilst it was decided that interested clubs would have to shell out £800 each for Walker, Tommy Lamph and John Edmondson. The services of Arthur Price would command £750. 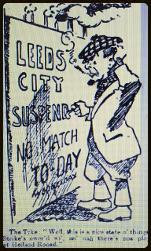 Mr W H Platts, an accountant who had been placed in control of the winding up of Leeds City’s affairs, declared that it would take at least another week to decide the future of the ground. Platts had decided that many of Leeds City's effects would be sold on and he instructed auctioneers, Whitham & Sons to arrange a sale of items such as goal posts, nets, kit, footballs and even the baths and showers. The Leeds City auction was in full swing and the troubled existence of the club was well and truly over. Coming soon: The Birth of Leeds United.